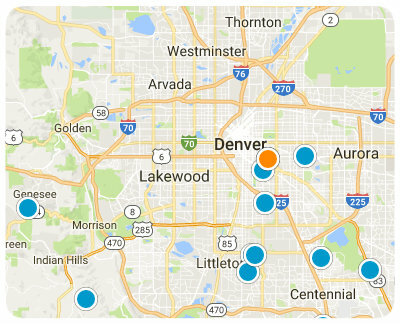 Home to approximately 107,000 residents, the City of Centennial, Colorado, is a great place to buy a home in the southern segment of the Denver Metro Area. Among its many great features, Centennial is one of the safest cities in the state and is found in the prestigious Arapahoe County. It is truly a community that offers something for everyone, including advanced business opportunities, a bevy of recreational options and gorgeous open spaces. For these, and many other reasons, Money Magazine ranked the city among the “Best Places to Live” in the U.S.
Centennial has a reputation as an innovative leader in successfully using private and public partnerships to provide cost effective and high quality municipal services to its businesses and broader community. The city also boasts excellent schools, served by the award winning Cherry Creek School District and Littleton Public Schools, both of which are top-rated in the state of Colorado. Furthermore, residents have quick and convenient access to a plethora of shopping, dining, entertainment and recreation opportunities, all of which add to the allure of this remarkable community. Homes for sale in Centennial, Colorado, include properties of varying ages, sizes and architectural styles. Whether you are looking for a perfect one bedroom apartment, a large and luxurious single family home, or something in between, you can find it in Centennial. Depending upon the specific features of the home, listing prices vary. Single professionals, families, empty nesters and retirees are all certain to find a space that meets their needs and is within their budget. If you would like more information regarding homes for sale in Centennial, Colorado, please allow us to assist you and contact us today.